Hey everybody, I'd like to thank all of you who tuned in to the YouTube thing to watch those video updates I posted from the road. It's something I never tried before, and was only made possible by borrowing my wife's laptop... baby, you're the greatest! 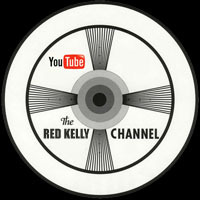 Anyway, I hope you enjoyed them as much as I did and, just in case you missed any of them, they're all still available over on The Red Kelly Channel. This 'special report' kind of summarizes the whole thing, and will hopefully give you an idea of what I was trying to accomplish. Thank You one and all for your continued support. 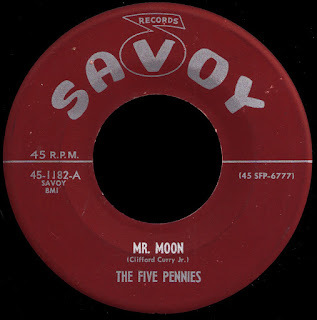 Our story actually begins with a record that was cut on a Jackson, Mississippi label called Trebco in 1961. A young kid named Tim Whitsett had a band called The Imperials that was immensely popular on the local dance scene. They had been featured on the radio (along with Sam Baker's Blue Notes), and were just knocking 'em dead. 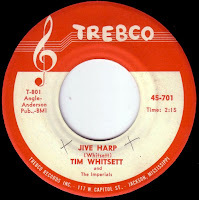 So much so that the Trebco release of Jive Harp was picked up by Imperial for national distribution. As their reputation spread, the Imperials began playing for a wider audience, spinning their wheels out on the Fraternity Circuit, and continuing to release singles (like Still A Lot Of Love) on a bunch of different labels. 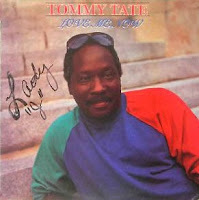 Tommy Lee Tate, meanwhile, had moved to the Jackson area as a kid, and came up singing Gospel in his Great Aunt's congregation. As a teenager, he found work as a drummer and vocalist on the club scene in Canton, just north of town. Bob McRee and brothers Cliff and Ed Thomas had opened up the small MAC studio in an old gas station out on O'Ferrell Avenue in West Jackson in the mid-sixties. They brought Tommy in and cut a single on him that they leased to ABC-Paramount, that didn't do much. On Soulful Kinda Music, Tim Whitsett is quoted as saying, "...my band was the backing band on nearly every release produced by Thomas-McRee-Thomas between 1964 and 1967." Which would seem to indicate that they were playing behind Tate on that release as well as on his subsequent Okeh 45. 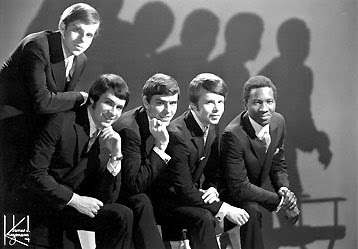 By 1966, Whitsett would make Tommy a full-fledged member (and lead vocalist) of his group, now known as The Imperial Show Band. As the only integrated act out there on the circuit (and with Tim's younger brother Carson now playing the Hammond B3), the Show Band became more popular than ever, traveling as far afield as Nashville, and even New York. 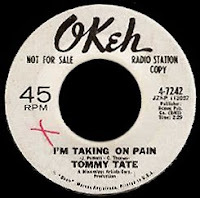 They would release a single on Bob McRee's local Big Ten label (as 'The Imperial Show Band featuring Tommy Tate'), and Okeh would send Tommy to Music City to work with Billy Sherrill for their next release on him in 1967. Enter the Crazy Cajun. 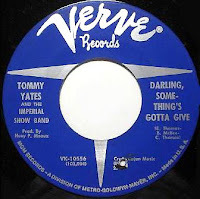 That's right, in late 1967 ( before the whole ATCO Andy Chapman thing), there was a Huey Meaux produced single by 'Tommy Yates and the Imperial Show Band' released on Verve. I'm not sure if the whole pseudonym thing was due to contractual reasons, or what, but here's another great 45 by Tate that he never got credit for. This must have been during the period when The Hombres hit was riding high on Verve, and Huey was able to use that leverage to place the 'Yates' record with them. In any event, it would appear to be Meaux's first collaboration with Thomas-McRee-Thomas, possibly even before the move to Grits n' Gravy. One more 'Imperial Show Band featuring Tommy Tate' single would follow (Musicor 1340) in 1968. Tim Whitsett, who by then was also the head of his own publishing company, had an office in the same building as a new studio that had opened up on Northside Drive in Jackson named Malaco. Tommy had begun writing songs as well, and the two of them hung around the studio, recording an occasional demo, and showcasing their music. 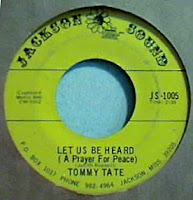 In early 1970, Tommy released a single on the small Jackson Sound label, but not much else seemed to be happening. Meanwhile, up in Memphis, Booker T had walked away from East McLemore Avenue in the wake of the whole Don Davis thing. 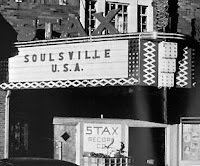 As Tim Whitsett told Rob Bowman in Soulsville U.S.A.; "Don Davis called me up and said '...I'm working at STAX now. I'm the new vice president there, and I want to build a new studio house band. I want you to put it together I want you to come up here and bring all your guys.'" Only by then, for one reason or another, The Imperial Show Band had ceased to exist, and everyone had gone their separate ways. "Come up here anyway, and we'll figure out what to do," Davis told him. And so, in April of 1970, old friends Tim Whitsett and Tommy Tate made the drive to Memphis to see Davis. Within the first week, Whitsett had been put in charge of East Memphis Music, the publishing division at Stax, and Tommy was signed as a songwriter. 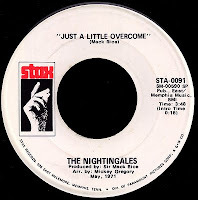 When Ollie Hoskins left The Nightingales to pursue his solo career that Summer, Mack Rice chose Tate as his replacement, an arrangement which resulted in two excellent singles over the next year. When those records failed to chart, he left the group to try and cut something on his own. With Don Davis out the door, Stax' other mover and shaker from up north, Johnny Baylor, had begun to insert himself into the mix. He had brought Luther Ingram down to Memphis from New York, and worked out a distribution agreement with Al Bell for his Ko Ko label in 1969. 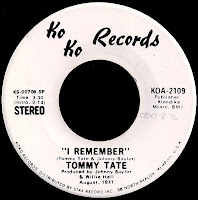 For some reason or other, after his stint with The Nightingales, it was decided that Tommy Tate would be signed to Ko Ko rather than Stax, an arrangement which Tommy would come to regret. Luther Ingram was Baylor's first priority, and he had charted eight times for Ko Ko by early 1972. When the mighty, mighty (If Loving You Is Wrong) I Don't Want To Be Right busted things wide open that Summer (spending a month at #1 R&B in the process), it solidified Baylor's position at Stax, and made Ingram even more the center of his attention. 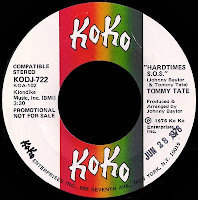 Tommy Tate's second Ko Ko single, School Of Life (which he had written with Mickey Gregory), would cruise to #22 R&B while Luther's record was still holding down the top slot, but it just couldn't compete with something like that. He appeared at Wattstax that August, but his performance didn't make the film. Baylor's strong armed, gun-waving tactics are the stuff of legend and, some say, had him 'running things' at Stax by then. Tommy told Rob Bowman that he 'felt like a prisoner' during his time with Baylor; "When I discovered what I hooked up in, it scared the Hell out of me," he said. Although he did chart twice more for the label in 1976, "I finally decided to cut it off," he told Bowman, "He [Baylor] told me that he would come to Mississippi and bury me... he was saying 'I will come there and off you.'" Imagine? 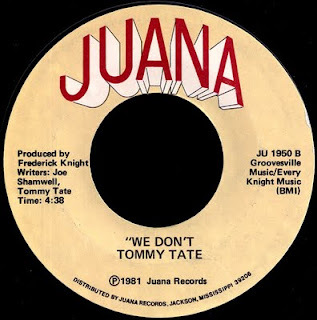 With Stax (and finally Ko Ko) going belly up, by the late seventies, Tommy was back in Jackson concentrating on his songwriting. Malaco by then had become a force to be reckoned with, on the heels of Dorothy Moore's Misty Blue. Dorothy had also sung with The Imperials and worked with Tommy at both MAC and Grits n' Gravy, so he felt right at home. He continued to record demos of his songs, which would later be picked up by Malaco signings like Bobby Bland and Johnnie Taylor but, for whatever reason, they never cut him as an artist in his own right. He signed instead with a small local label named Sundance, which was run by a friend of his named Sam Kazery. This arrangement would produce four singles beginning in 1979, and also create 'enough material for thirty albums', as he told Heikki Suosalo in Soul Express a few years ago. That material remains unheard. Tommy had begun writing with Joe Shamwell while he was still at Stax, and when Shamwell made the move to Malaco, the two began collaborating again. Enter another Stax alumni, Frederick Knight. Knight had been working with Neal Hemphill at his fabled Sounds of Birmingham studio in Alabama, and sending demo tapes on a regular basis to Tim Whitsett over at Stax. "Every time I sent him a tape," Knight told Rob Bowman, "he said 'Man, you're real close, but I don't hear that out-of-the-park smash... if you're gonna be an artist, you've got to be different.'" Frederick found that something different in a riff that Hemphill guitarist Jerry Weaver had come up with and, along with Aaron Varnell and Glen Wood, cut I've Been Lonely For So Long in one night, and sent the tape up to Tim at Stax. He flipped, and when the label released it in early 1972, it went straight to the R&B top ten. Knight's follow-up singles on Stax didn't do much, and he felt himself drawn back into the songwriting and production side of things. After the demise of the big company, he was approached by Henry Stone down in Miami, who wanted him to come and record for his T.K. imprint. He worked out a deal instead in which Henry would distribute Frederick's Knight Productions on his own Juana label. Stone was also distributing Malaco, and he suggested that Knight go to Jackson and check it out. Over the next few years he 'found a home' at the studio, and it became his base of operations. 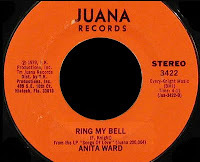 A record he produced there on a singer named Anita Ward would dominate both the R&B and Pop charts in the Summer of 1979, as Ring My Bell helped defined the 'disco' sound that was sweeping the nation at the time. 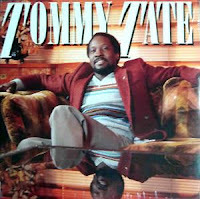 In 1981, Knight would produce an album called simply Tommy Tate, that would bring Tommy back into the spotlight where he belonged. This absolutely incredible selection we have here today (written with Joe Shamwell) was the flip of the first single released from the LP, For The Dollar Bill. While it may be a little too 'uptown' for a lot of you out there, it just kills me. Check out this man's voice, brothers and sisters... whoa! Soul personified, man. With T.K. out of business, however, Juana had no distribution to speak of, and excellent records like this one just died on the vine. Although Tommy soldiered on at Malaco, writing great music for the label's roster of R&B veterans, the label didn't seem to realize what it had. In 1990, old friend Tim Whitsett produced an album on him called Love Me Now, that would appear on his own Urgent! label. Predictably, nothing much came of it. Tommy, meanwhile, was 'big in Japan', and another LP, All Or Nothing, only saw release in that country. At this late date, all of this seems inconceivable to me. I mean, how is it that so great a talent as Tommy Tate was unable to get the recognition he deserved? No man is a prophet in his own home, I guess. In the U.K., however, Tommy has been appreciated for years, and is the subject of several recent releases. 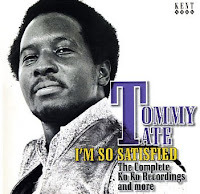 Ace has put together a great package called I'm So Satisfied that collects all of his Ko Ko and Stax era recordings for the first time ever on CD. 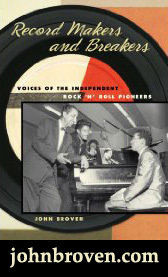 With 15 pages of liner notes written by Tony Rounce, it's well worth the price of admission. 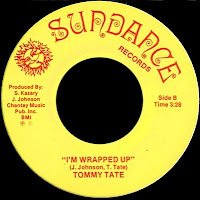 In those notes, Rounce says "Tommy turns 62 in September of 2007, which is still relatively young for a veteran soul man. 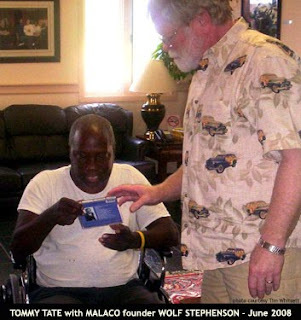 There can be no doubt that everyone who buys this CD would love to see and hear from him again." No doubt. Soulscape, meanwhile, has issued two volumes of Tommy's rare and unreleased material. Hold On is a collection of his more obscure Jackson based 45s, along with some unissued material, that was put together and annotated by none other than Tim Whitsett himself. 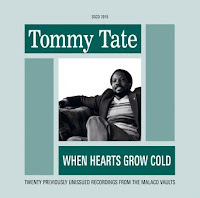 The label's most recent release, When Hearts Grow Cold, presents Tommy's highly regarded Malaco and Muscle Shoals recorded demos for the first time ever. No less an authority than John Ridley has said, "...his songs cut by Otis Clay, Johnnie Taylor and Bobby Bland are simply magnificent. And if you think they're good I can assure you they're not a patch on Tate's own Muscle Shoals demos. I would say that he's the best true soul singer still plying his trade - and my first choice for a recording deal when I win the lottery." 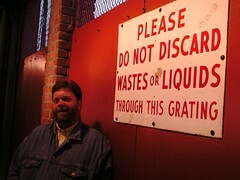 Sadly, however, whether or not Sir Shambling hits the Lotto, Tommy's singing days now appear to be over. After a series of strokes left him confined to a wheelchair, he is now living in a nursing home down in Jackson. Forest Hill Nursing Center, Inc.